Body-Art is making art with real bodys. Origined from the idea to cast a real body in detail, I developed a method to make moulds from living persons and cast art-objects from them. 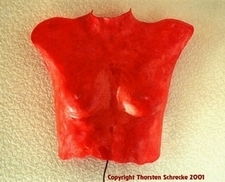 Besides the Body-Lamp there are a lot of different ways to make a bodycast an art-object. Sometimes more useful items (like a tailors-dummy of the own body) or more artistic (a garden statue). 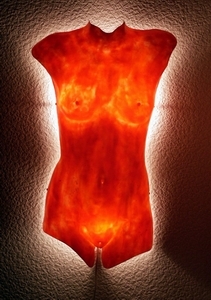 A successful test is this Body-Lamp, a wall mounted lamp of a woman's torso. There are a lot of other uses possible. Creativety knows no limits. Ask me if you want a tailors dummy of yourself or a special present for your boy- or girlfriend. I will design an object especially for you and give you an estimate. It is possible to cast parts of the body or the whole body, like you want it. To make an object like this you need to make a mould of a living person, without hurting the person. Not an easy task and it asks for total physical appearence and strength of the model, because depending on the size of the mould the procedure may takeover an hour. To create the mould a nontoxic material is used. It is applied in a thin layer and reinforced by plaster, to keep the shape and make the mould stable. The plaster does not have contact to the skin in large areas, like when making facial moulds with plaster-bandages from the pharmacy. Because plaster is not good for the skin and does not give that lot of detail like it is wanted here, it is not used as a mouldmaking material. You never should try to use it! The material used for Body-Art is natural, skinfriendly and also used in cosmetics. Depending on the final product wanted, the mould then will be filled with a casting material. To create a Body-Lamp you need for example a thin layer of coloured epoxy resin. Each cast is an original because the mould can only be used once! The reproduction finally shows that the work has paid. Every little pore of the skin is visible in detail. The further treatment of the cast depends on what result is wanted. For the Body-Lamp the epoxy-piece will be cut to the final shape and polished or painted. 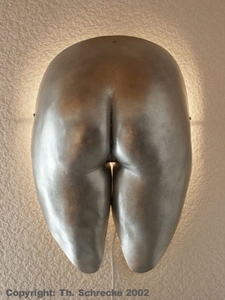 The exact design of the Body-Lamp is as individual as the body it was casted from and depends on the customers request. There are also casts possible in other materials, like plaster, concrete, wax or foam. Depending on your ideas an individual object will be made, which is unique in shape and look. Are you curious now? Then call me! I will give you an individual estimate.